Remember those yummy dishes momma used to cook for dinner? We’re sure you do. Try your hand at this recipe that we've learned from our own mothers. Sweeten up your day by cooking something for mom! 1. To begin, clean and season the fish. Coat it with flour and fry until crispy. 2. In small bowl, combine together the soy sauce, rice wine, tomato sauce, vinegar and sugar. Add 500 ml water and set aside. 3. Dilute the cornstarch in 6 tablespoons of cold water. Set mix aside. 4. 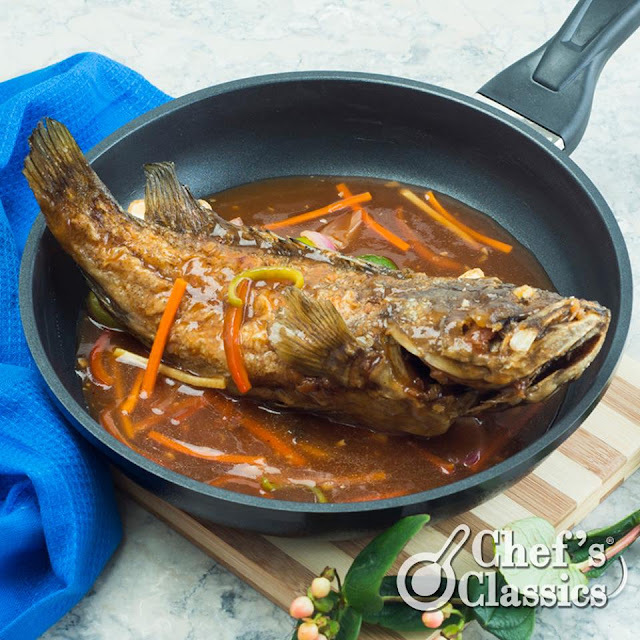 Heat the oil in your Chef’s Classics Hibiscus Fry pan. 5. Saute the garlic, ginger, bell peppers and carrots for two minutes. Transfer to a plate and set aside. 6. In the same pan, add onion and cook for two minutes. 7. Add tomato sauce mixture and let it boil. 8. Mix in the cooked vegetables. 9. Stir in the diluted cornstarch. Continue stirring until the sauce thickens. 10. Add water to adjust consistency. 11. Simmer for a few minutes, and season to taste! 12. Pour the sauce on the fried Lapu-lapu, and serve immediately.